I teach 3 methods of how to paddle your sup straight. 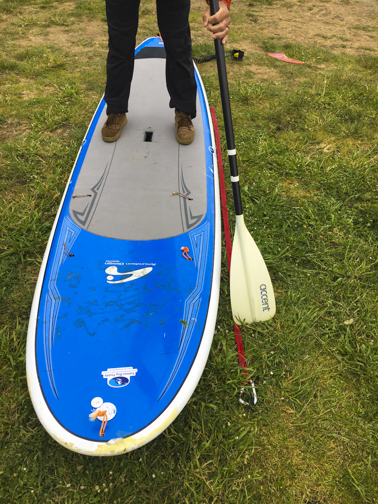 One is keeping your paddle shaft vertical (hand over water) during the forward stroke.The second is to draw the paddle in a straight line from your nose to your feet to the exit. 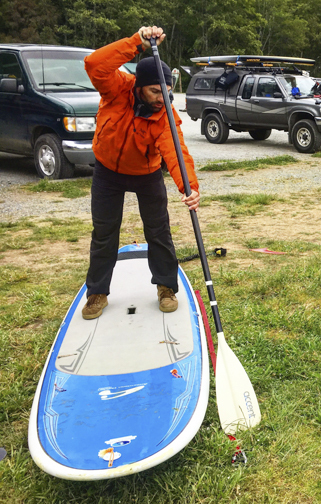 In the enclosed photo, PSUPA instructor Brent Roth demonstrates with a car strap how to not curve around the nose, but rather place the paddle in the water a few inches from the nose, as long as it’s a straight line to the rail and your feet. If you curve around the nose, you’ll turn the board and will be doing a mild forward sweep stroke. In doing so, keep you hands super loose, even in rough water, reach forward and as soon as you bend, let the paddle dip in the pull towards your feet. **In both photos, his shaft should be more vertical (or upper hand over the water). Questions? Give me a holler..